French police appeared overwhelmed during Saturday's protest, as demonstrators ran amok on Paris' famous Champs-Elysee Avenue. So-called black bloc protesters vandalized a popular upscale restaurant, luxury stores, a bank, a chocolatier and several newsstands. "Analysis of yesterday's events highlights that the measures taken were insufficient to contain the violence and prevent wrongdoing," Philippe said. Read more: Did anti-Semites infiltrate France's yellow vests? Figures from across the political spectrum blamed Macron's government for not being able to control the situation. Paris' socialist mayor, Anne Hidalgo, said on Sunday that she was waiting for "an explanation" from the government, adding that she was "really angry" at the "unprecedented violence". 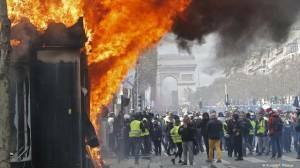 Finance Minister Bruno Le Maire is set to host a meeting on Monday with trade groups, business groups and insurers, to discuss the economic impact of the protests, his office said. The hearings are meant to discuss "the means put in place to deal with these disorders." Lawmakers noted the resulting downgrade in France's trading situation and "economic attractiveness," as a consequence of the disruptions on the street, the Senate said in a statement Sunday.